Chocolate eclairs recipe for two, a small batch of homemade eclairs. Homemade small batch pastry cream recipe, too. These mini chocolate eclairs for two positively melt my heart. I want to dunk them in my coffee in the morning, snack on them in the afternoon, and eat them for dessert after dinner. The good news in that scenario is that this recipe only makes 6 mini two-bite eclairs. If you share these with someone you love, you’re almost guaranteed to not eat the whole batch yourself…almost. For some divine reason, pâté à choux dough is easy to scale down. Of all the things I thought would cause me to reach for the cork screw before 5:00, pâté à choux is not one of them. (By the way, Cabernet is my favorite problem solver ever). Cookies, on the other hand, give me loads of trouble when scaling down. Switch out just 1 teaspoon of something-or-other, and the cookies spread across the entire sheet and crisp to black in no time. 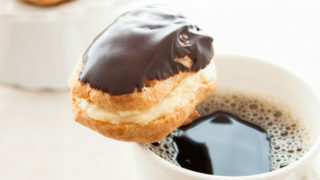 But delicate French pastry filled with rich cream and topped with chocolate? A cinch. Maybe a little too easy (says my waistline). I used my Cream Puffs for two recipe, but I discovered something important worth mentioning–now that I’m cooking on a gas stove, I find that the pan doesn’t hold as much heat once turned off. So, if you’re cooking on a gas stove, instead of turning the heat entirely off to incorporate the flour, just turn it to low. If you’re cooking on a glass cooktop, turn it off–those things hold enough heat to burn you 6 hours later. Yes, this is exactly what I’m eating in those photos on my About page. Sorry to tease you for so long, but here they are! I took a few photos to help you along the way. The dough clings to the spoon and become hard to stir. This is also what I’m referring to when I say if you have a gas stove, turn the heat to low; if you have a glass cooktop, turn the heat completely off. If the dough does not clump around the spoon after 1 minute, turn the heat up slightly and continue to stir. 1) As soon as the dough clumps together, move it to a mixing bowl, and begin beating it with an electric mixer until it is warm to the touch, about 1-2 minutes. 2) Once the dough has cooled, add the egg and continue beating. 3) Beat until the dough falls off the beaters in sheets, and is pale yellow. 4) Notice the color change from photo three to four? Perfection! Now, go on! 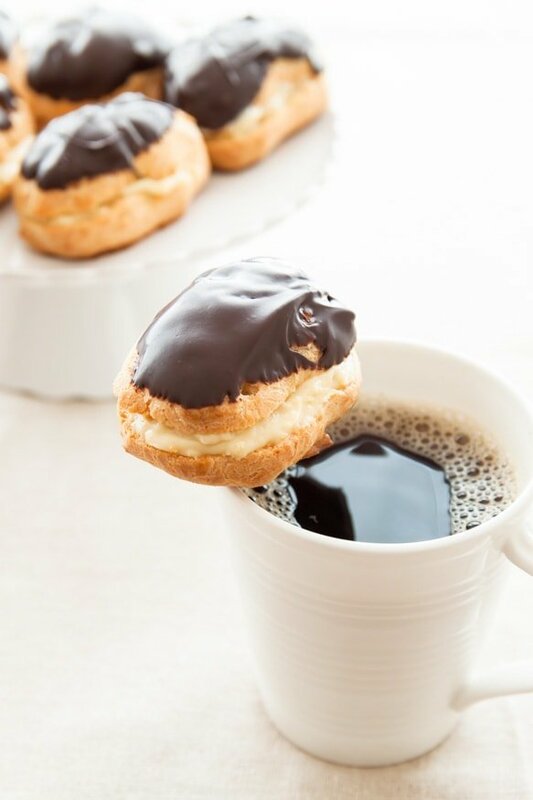 Make delicate French pastries and dunk them in black coffee because you deserve it! I used my silicone mat when baking these chocolate eclairs, and I highly recommend using one when baking. 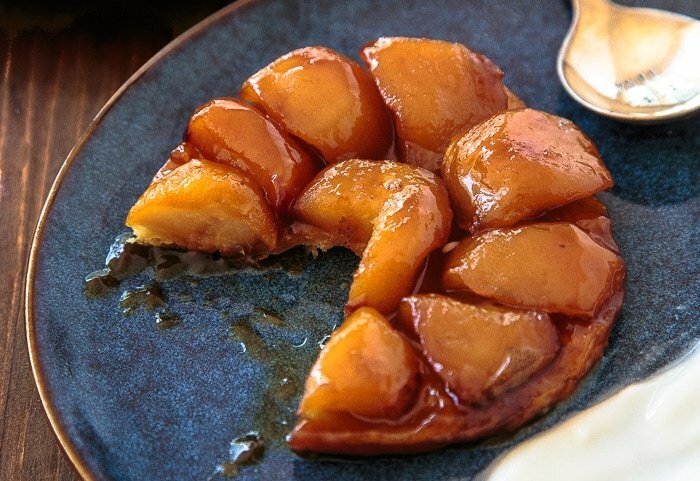 Looking for more French desserts? 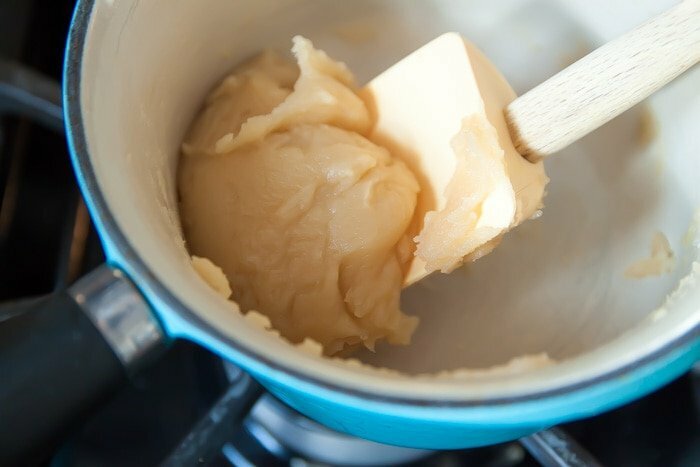 First, make the pastry cream: In a small saucepan, warm the heavy cream until the tiniest of bubbles appear on the edge of the pan--do NOT boil. Meanwhile, in a medium bowl, whisk together the flour, sugar and salt. Add the egg yolks, and whisk. It will be crumbly, it's fine. Slowly pour the warm cream into the egg yolk mixture, a tablespoon or so at a time. Continue to whisk as you pour. Next, pour the entire mixture back into the saucepan over medium heat. Whisk constantly while it comes to a simmer. Once simmering, it will begin to thicken. Once large bubbles pop on the surface, continue to cook for a few more seconds while whisking, then remove from heat. Stir in the vanilla. Scrape the pastry cream into a bowl, press a piece of plastic wrap directly on the surface, then chill in the fridge for at least 3 hours. Next, make the eclairs: Preheat the oven to 400 degrees. Line a sheet pan with a silicone mat or parchment paper. In a small saucepan, stir together the water and butter over low heat. Let the butter gently melt without bringing the water to a rolling boil for too long. Remove the water-butter mixture from heat, and add the flour, sugar and salt mixture all at once. Stir, stir, stir. Put the pan back on the burner that's been turned off and stir until the dough starts to pull away from the sides of the pan. In other words, the dough will stick together in one big clump around the spoon and not the edges of the pan. It happens in about 1 minute. This is the part where you may have to leave your burner on low if you're cooking with gas or electric burners. If using a glass cook-top, turn it off entirely for this step. Scrape the dough into a mixing bowl, and beat on low speed with an electric mixture until the mixture is only warm to the touch (about 1-2 minutes). Add the egg and continue beating. Beat for a few minutes, until the dough falls off the beaters in sheets and is pale yellow. 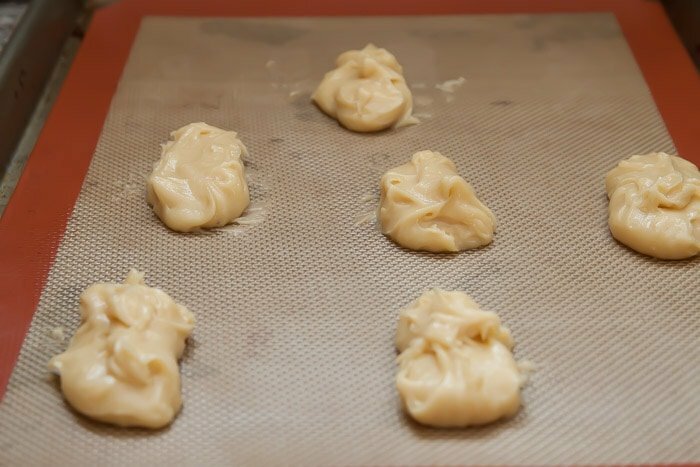 Scrape the mixture into a piping bags (or use two spoons). To get the most rise out of your dough, scoop 3 balls of dough and pile the dough on top of itself with the edge of a spoon. (See photo for reference). You should get 6 eclairs. 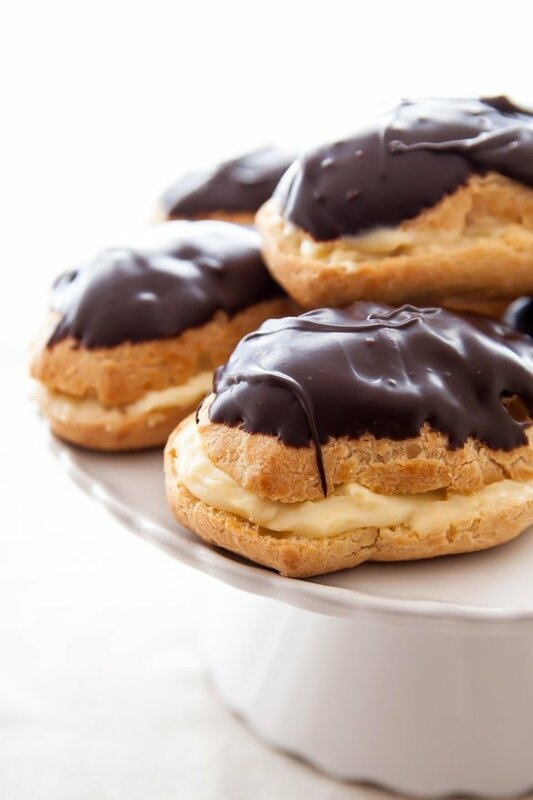 Bake the eclairs for 10 minutes, then open the oven door for 5 seconds, lower the heat to 350, and close the door. Continue to bake at 350 for 18-20 minutes. Do not be afraid of brownness--if you under-bake, the insides do not dry out. See photo for reference. 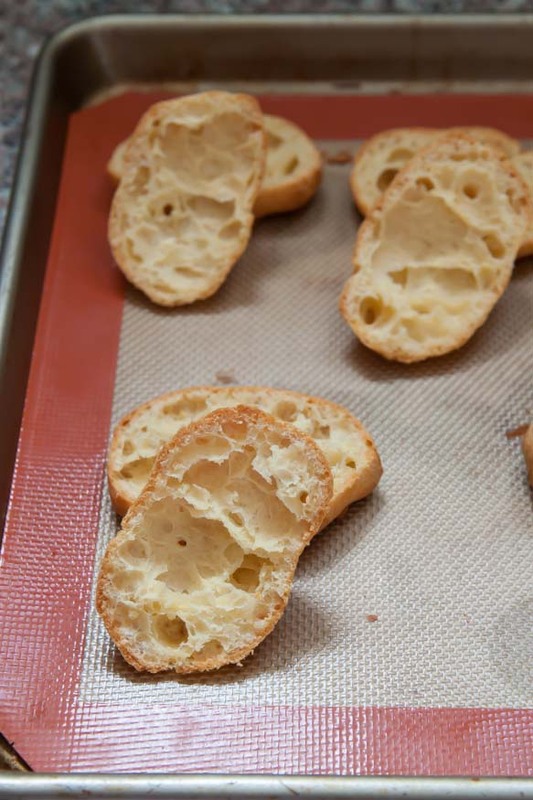 When the eclairs are done baking, turn the oven off, and remove the sheet from the oven. Using a thin knife, poke a hole in the side of each eclair. You will eventually cut all the way through the eclair to fill it with the pastry cream, but for now, just cut a slit so steam can escape. Return the pan to the turned-off oven, and let cool for 30 minutes with the oven door ajar. Next, slice the eclairs in half, and fill with the chilled pastry cream. For the chocolate topping, combine the chocolate and coconut oil in a small bowl. Stir well, then microwave in 10-second pulses until almost all the way melted, stirring between each pulse. Dip the tops of the eclairs in the chocolate, and chill until set for 15 minutes. The eclairs taste best served within a few hours of making, but they will keep covered in the fridge for 1 day. Pastry cream recipe adapted from TheKitchn. This is so AMAZING! Wow. I want these. The fact that you’re making these, and the pastry cream, for 2…is…unreal. And awesome! And the look on your face = priceless. And you have flawless skin!! I wish I could pin that :) but I will pin the eclairs! You think like I do! I add veggies to my day to ‘compensate’ for desserts. If I want dessert, I *will* snack on carrots and celery sticks mid-day. And I think about that dessert the entire time I’m doing it, hehe! If Monday mornings involved mini eclairs on a regular basis getting out of bed on time wouldn’t be so hard….in fact, I’d get up early. Love how easy these are to make AND how you cut the recipe down. Oh my… Eclairs for two, this is going to be a problem! Your photos are lovely, they make me wanna lick my computer screen! These look unreal!! So yummy. I’ve never scaled down pâté à choux dough, nice to know that you can! And eclairs for two, how perfect is that?!?! Yum! Your eclairs look particularly perfect. 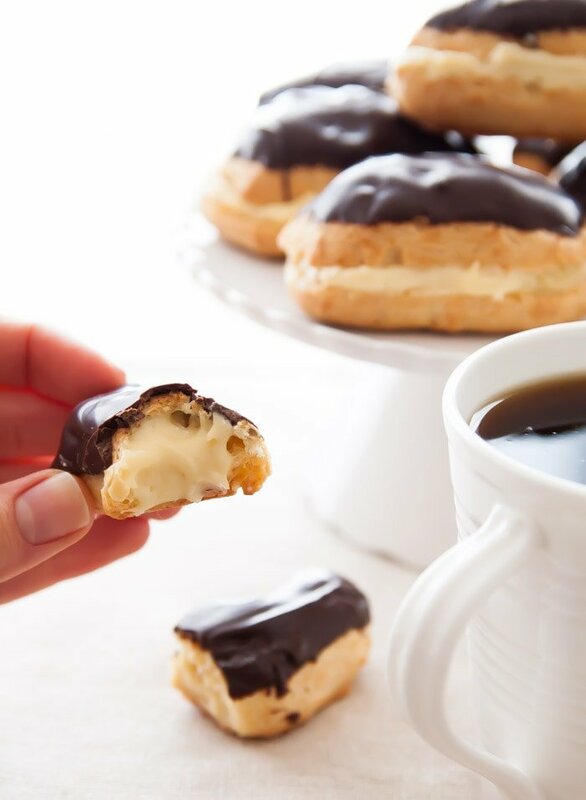 this is probably what i will make after my whole30 is over..
Wow..just wow.. please bring these to Atlanta..
Chocolate eclairs are one of my most favourite things. And the filling in these looks exquisite. I have pinned them to my teatime board and can’t wait to make them! I could easily eat an entire batch of these myself (or probably a double batch!) they look absolutely incredible! Adorable! And by that, i mean both the eclairs and your hair!I’m loving your little bob! Perfect. Absolutely perfect. I think I am going to make these right now. These chocolate eclairs are amazing!!!! I am in love! 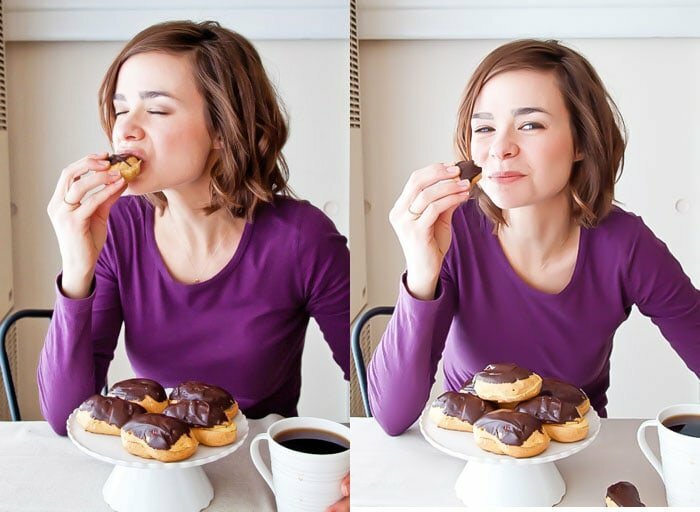 Girl, you and the eclairs look amazing in those pictures! I am loving your brows!!!! I have always been scared of pate a choux but you made it look so easy. I want to make these. ASAP. Maybe after we move as a celebratory thing. LOVE these puffs. I could eat all day myself! the pastry is really kind of easy once you do it and follow directions. 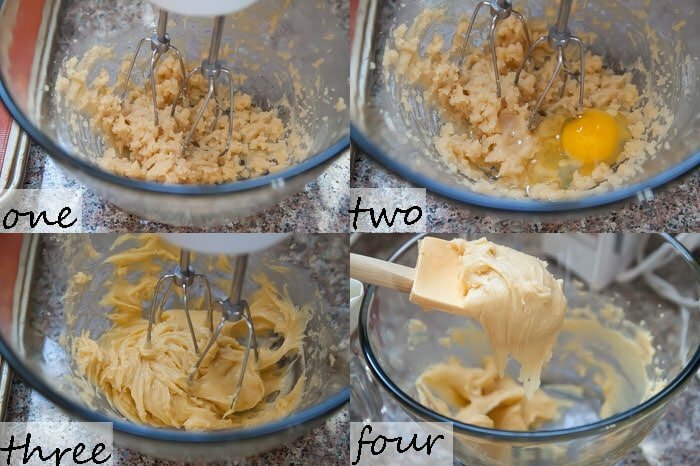 I used my hand to beat each egg instead of the mixer, think I might do your version instead, save my hands !!!! Not going to lie — I’d probably eat all six of these myself. No shame. But if that’s what the baby wants…. HOLY WOWZERS. I love love love eclairs, but I am so intimated by the dough. Very cool to know that you can scale it down! Pate a choux is definitely one of my favorite things to make! 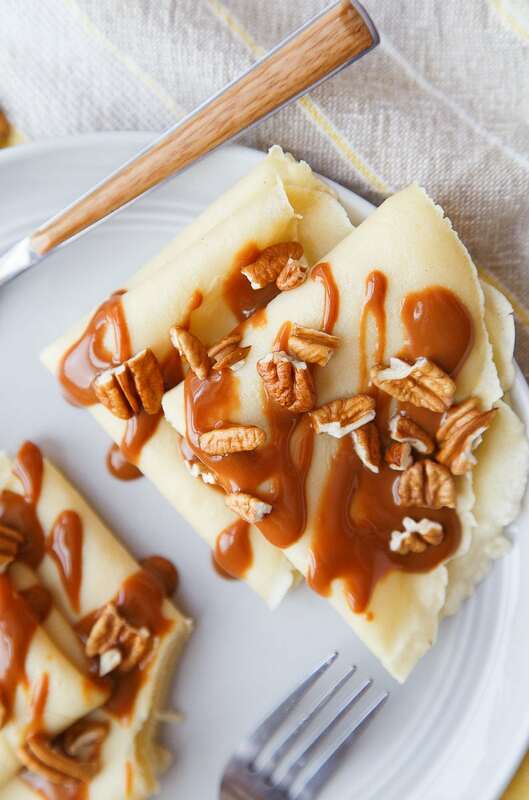 Because for how fancy it seems, it’s actually super easy to make. I love these eclairs for two!! Although, around me…they might just be eclairs for one. Truth. I would have a hard time sharing these little eclairs! Beautiful! THESE GUYS??? holy sweet mother of god. Oh, these are perfect! I haven’t had an eclair in years and a little batch of these beauties must be made soon! You are the cutest! Such a pretty photo of you and those rad looking eclairs. I’ve been in such a choux mood, and this is the final push! Finding out that pate a choux is easy to scale down could be dangerous. I can easily see me making this dough and consuming the eclairs once a week. I love the photos of you eating the eclairs. You really look like you’re enjoying them. They look wonderful. Pinned. Totally tantalizing pictures of the chocolate eclairs …. If only my screen was scratch and taste! I love everything about this from the step-by-step, to the perfect photos, to the adorable girl eating this tasty treat! Heads up: I’m eating all 6. Eclairs are the best! I think the pastry cream inside is my favorite. Thanks for the tip on making these with the gas stove, also I have to agree that there is no problem in the kitchen that can’t be solved with a glass of wine or cocktail! These are so genius! LOVE eclairs and this downsized recipe! Pinning! The look on your face says it all, they look fantastic! Oof, I am dying over these. And your CUTENESS. Seriously, you can’t be any more freakin’ adorable. Oh, my goodness, there has never been a more perfect or lust-worthy little pastry! I can’t remember the last time I had a proper eclair, and I’m absolutely dying for one now. I really must return to the challenge of making vegan pate choux! Unbelievably gorgeous! Wow. I am sitting here drooling all over the keyboard and kind of wishing that big plateful of these eclairs would appear in front of me. I can’t wait to try these. pinned! Oh my heavens, Christina. These look amazing! I don’t know why I haven’t looked st your blog more as I am in love with deserts for two. I scout play have a couple cookies for two recipes on my blog that I think are pretty good. But I can tell I need these in my life asap. I love your site! Such a great idea for desserts. I recently made éclairs and mentioned your recipe in my post. Can’t wait to try them! I love eclairs soooooo much, you don’t even know. I’ll take the whole batch, please! That cream and chocolate looks incredible. It is probably a good thing that I don’t have these in front of me right now or I would eat them all! Any changes in procedure or effect if I triple the recipe? Hi Christina . I didn’t make the choux pastry.I only made the pastry cream, because I was looking for a small batch of pastry cream.And I’ve made the recipe twice so far, the only things I changed was that I used a whole egg for the place of the egg yolks for both times, I also used whole milk instead of the heavy cream, both times. The only other thing I changed was that I used cornstarch instead of flour, because the first time I made it it had a doughy taste.But overall, I liked the recipe very much.Thanks for sharing. I loved this recipe! My dad absolutely loved them(he usually hates pastries) and ate about 2/3 of my batch! I altered the pastry cream a bit due to some complications, but overall, LOVED this recipe so much. Will put this in my recipe book and keep following this recipe because it’s fantastic. I tried this recipe twice and be pastry cream worked well but I’ve done the pastry dough twice now and it doesn’t seem to be working well. It clumped up but still seems too liquid so I dumped that and tried again. I added more flour and it seemed to be better so I continued to the next steps. But once I piped I noticed it was still too liquid and decided to bake anyway and see what happens. They flattened a lot but still puffed up. If you have any ideas of what I’m doing wrong or tips to help that would be so much appreciated!! Tried and loved a ton of your other recipes for myself and my boyfriend and can’t wait to master this one! 1. Be sure to cook the pastry in the pan for a full 1 minutes, or until it clumps around the spoon and seems thick. 2. Be sure you’re using the right size eggs (large). Extra egg (even just 1 tablespoon more in an extra large egg) will make these too runny. 3. Be sure you’re beating the dough long enough so that it changes color and falls on the beaters almost in sheets. This will give it more structure. I have made your full eclair recipe 3 times as of today. I’m trying to nail this recipe! Heh. So many failures on my part. The first time, my pastry cream overcooked and became stringy. After deep breaths and googling, an immersion blender fixed that. Then I opened the oven while the pate a choux was baking, oh and ended up with flat domes of eclairs. Smh. But I made the first batch into eclair sandwiches and still made the chocolate glaze. Delish! The second time, I learned my lesson! I watched my pastry cream and my eclair dough. Both turned out excellent. Buuut, one of my siblings opened the oven!!!!! So my eclairs fell, but not as much. *Sigh*. But they rose enough. I was able to cut them into about 1 in” tall eclairs. Soo, batch 3. I watched my pastry cream like a hawk, guarded the oven (I locked it and am still sitting in front of it). Everything is coming out fine! The pastry cream is soo rich and thick! I love it. I’m thinking—once this recipe is mastered–to flavor the cream different ways and eat it as pudding. The eclair is delish whether or not it rises. Tips for those attempting this recipe–watch the pastry cream. DONT turn away for a second. Keep the oven closed for the first 10 min of baking. No worries if they don’t turn out looking like the picture, they will still be delicious. So great to find a mini pate choux recipe. These were great!!! Thank you!!!!! Gavé bon. Testée et approuvée pour le goûter. Contente qu’il n’y en avait pas plus que six, ça aurait pu mal se finir sur la balance, haha… Merci pour cette recette ! I have made these a few times and they are excellent. Key point, make sure water butter mixture is a rolling boil before adding flour mix. I just use my favourite chocolate glaze instead of recipe suggestion. Hi, I don’t know the difference, I have coconut oil but not virgin coconut oil. Would that work as well? Thanks. I made these and they turned out awesome! I have included a link to the photo of them. I decided to make round ones and I was able to get 9. I also didn’t want to cut them in half so I filled it from the bottom. The only problem I had when doing that I had a hard time knowing when it was full so it started coming through the top. Oh well, still good! I had to make a second batch of cream as well. I’m sure I would have had enough to fill them all if I hadn’t been eating it sometimes. I posted a photo of these in a cake decorating group on Facebook and was asked for the recipe by many people. I posted the link to your site and also said they must try your other recipes. Thanks for everything you do. The filling came out great, the pastry not so much. They didn’t rise, looked more like lady fingers. I am not sure what happened. I might have gone wrong when heating the dough?